The inability to maintain high concentrations of antibiotic at the site of infection for an extended period of time along with dead space management is still the driving challenge in treatment of osteomyelitis. 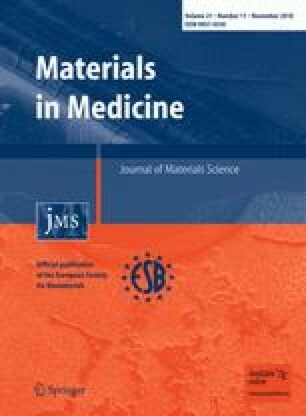 Porous bioactive ceramics such as hydroxyapatite (HAp) and beta-tri calcium phosphate (β-TCP) were some of the alternatives to be used as local drug delivery system. However, high porosity and high interconnectivity of pores in the scaffolds play a pivotal role in the drug release and bone resorption. Ceftriaxone is a cephalosporin that has lost its clinical popularity. But has recently been reported to exhibit better bactericidal activity in vitro and reduced probability of resistance development, in combination with sulbactam, a β-lactamase inhibitor. In this article, a novel approach of forming HAp and pure β-TCP based porous scaffolds by applying together starch consolidation with foaming method was used. For the purpose, pure HAp and β-TCP were prepared in the laboratory and after thorough characterization (including XRD, FTIR, particle size distribution, etc.) the powders were used for scaffold fabrication. The ability of these scaffolds to release drugs suitably for osteomyelitis was studied in vitro. The results of the study indicated that HAp exhibited better drug release profile than β-TCP when drug was used alone indicating the high influence of the carrier material. However, this restriction got relaxed when a bilayered scaffold was formed using chitosan along with the drug. SEM studies along with EDAX on the drug-chitosan bilayered scaffold showed closest apposition of this combination to the calcium phosphate surface. The authors wish to express their sincere thanks to Department of Science and Technology, India and Fundação para a Ciência e a Tecnologia, Portugal for funding this work and the Director, CGCRI, India and CICECO, University of Aveiro, Portugal for their support. All the personnel related to the characterization of the materials are sincerely acknowledged. ASTM Standard C773-88. Standard test method for compressive (crushing) strength of fired whiteware materials. West Conshohocken, PA: ASTM International; 2006. doi: 10.1520/C0773-88R06.